A couple of the comments on a previous post about social media discourse got me thinking. I know that atheism does not mean anything other than the lack of belief in gods. I also know that atheists suffer from all the same flaws that afflict all humans. And so, I am making a mistake when I expect atheists to be any more rational, reasonable, skeptical, kind, etc. than humans in general. I am not sure I will ever manage to come to terms with this entirely, though. Even though I know it is a mistake, I continue to find myself expecting something a little bit better from my fellow atheists and from myself. Being an atheist does not obligate one to treat religious believers poorly. 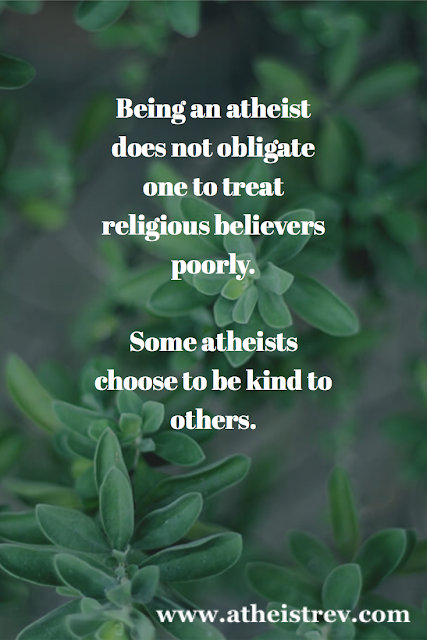 Some atheists choose to be kind to others. There's nothing inherent in atheism that says we must be hostile to religious believers at every opportunity. And yes, this applies not just to religious believers but to everyone. It even applies to people who have different political views!